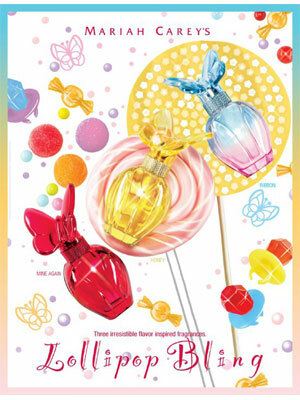 Lollipop Bling Ribbon Perfume by Mariah Carey. Launched in August 2010 by Elizabeth Arden. Ribbon perfume is a floral fruity fragrance. "A mouthwatering fragrance inspired by the flavor of the Blue Raspberry Ring Pop is combined with a beautiful floral bouquet." Available in a 1.0oz EDP spray. Inspired by Ring Pops, this sugary scent has a sultry whitewood base. 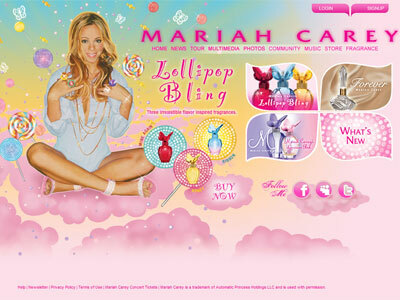 Mariah Carey Lollipop Bling in Ribbon, $35. A romantic duet both floral and fruity. A mouth-watering fragrance inspired by the flavor of the Blue Raspberry Ring Pop is combined with a beautiful floral bouquet.